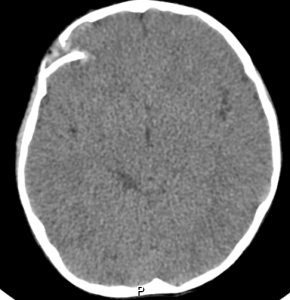 The subject is a 6 year old male who presented with a 4cm gash over the right eye. He reported no loss of consciousness, GCS 14, and no signs of neurological deficits were apparent. Bleeding was controlled at which time the physician believed he detected clear fluid, possibly CSF coming from the wound as well as a softness in the area. The patient was transported to emergency care where a CT scan showed a depressed skull fracture with bone fragments protruding into the brain. A complication was air introduced into the cranium, which ruled out transportation by air. The options presented were immediate surgery or wait to see if the air resolved in a few days. Surgery was chosen because of the obvious severity of the injury and possibility of infection. This had either been missed or was not visible (possibly deep in the wound) by two physicians prior to surgery. Pre-surgical CT showing fracture to the right upper forehead. Surgery was successful although the surgeon reported that the dura mater was torn and could not be sewn. A synthetic material was used to patch this, and gelfoam was used to control further bleeding. The bone was set back into place. 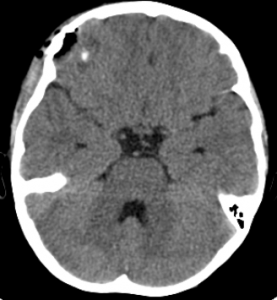 The patient showed no obvious neurological deficits. Post operative CT showing bone in place and air in wound. The subject in this case was my six year old son and I am presenting it here for SAR volunteers to learn a little about depressed skull fractures. I’ve seen a few head wounds in my years as a camp counsellor and at first I was unconcerned. There is always a lot of blood from a head wound and sometimes it looks much worse than it is. I felt that a few stitches were all it would take to close it up and all would be well. My first question to my son was whether he had lost consciousness – and he said he had definitely not. He reported that he’d tripped, fell, and hit his head on a marble table in the hotel lobby. I realized later that I did not take the time to interview witnesses as to the mechanism of injury. I was frankly shocked to see the CT scan and the extent of the damage. The seriousness of the injury was made even more apparent after the surgery when the surgeon reported that there was hair in the wound which almost certainly would have resulted in infection. The torn dura mater could have introduced this foreign matter deep into his brain. Everything about this case was made much more complicated by virtue of the fact that the accident happened in Mexico and there is a significant language barrier. This necessitated decisions being made regarding hospitals, emergency treatment, hours on the phone with the insurance companies, and so forth. Throughout the process the medical care was excellent, careful, compassionate and skilled as far as I could tell. However, despite their best efforts I believe my partner and I only understood about 75% of what was told to us because of the language barrier. I found myself scanning in the surgeon’s report, and running it through Google Translate to make sure I had understood what was happening. I ripped the CD of the medical imaging and sent them back to BC for friends to pass on to their neurosurgeon associates for a second opinion. The air in the wound was surprising both before and after surgery. Pre-surgery the air was two very tiny bubbles visible in a different CT slice than the one presented. Post surgery the air seemed to be extensive but in discussion with medical colleagues back home it was suggested that the gel foam may look like air on the CT Scan. I should report that at the time of this writing we are 5 days post operation and he is doing very well, and still shows no signs that I can detect of any problems. We’ve had a third CT scan and we’re cleared to fly home two days from now. First responder training is not always adequate to diagnose a depressed skull fracture. Loss of consciousness is not definitive in this diagnosis. Even a minor head wound can have hair embedded in it. This is not field treatable, but is something to keep in mind. Best to always suspect a fracture and transport rapidly to definitive care even without loss of consciousness. Any skull fracture may introduce air into the wound. In the context of BC Search and Rescue it’s unlikely we will ever fly at an altitude high enough for this to cause an issue, but it does need to be taken into consideration when arranging air transport. I’d like to thank all of my friends and colleagues for their support over these past eight days since the accident. Social media worked very well to ask for ideas and support from experts in my network all over the world. Despite feeling alone we knew there was a lot of people who cared about us, and it made a difference. Thanks for sharing this valuable experience. Wishing your son a successful and speedy recovery.